A hot knife is a very handy item to have in your tool kit if you sail boats and need to cut ropes. A hot knife can cut and seal nylon and polyester ropes in one action, preventing fraying and leaving a nice, clean rope end. If you only need to cut ropes one or twice a year, it can be hard to justify the cost of an electric hot knife, which can often be $150 or more. 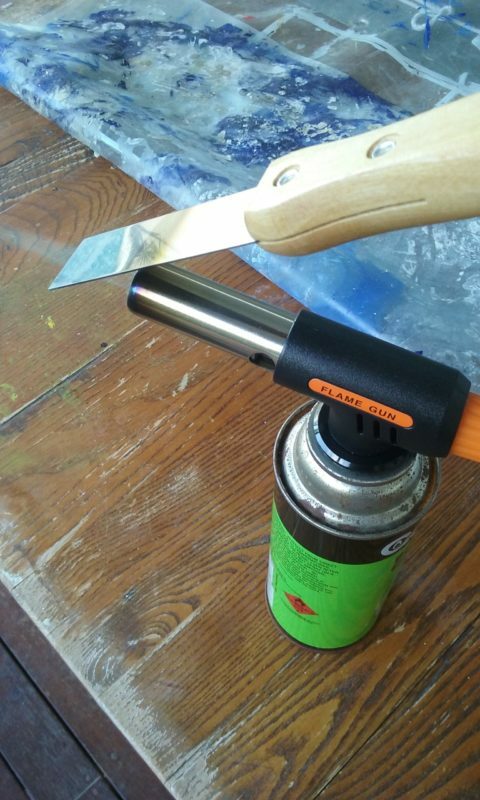 I looked at hot knife attachments to portable butane hot torches, but comments on the internet indicate that many are flimsy and break easily. My solution was to heat the end of a paint scraper tool on the wok burner of a gas BBQ. It worked well, but had the disadvantage that I needed to take ropes off my boats to my BBQ before I could cut and seal them. The alternative was to use a portable butane blow torch to heat the paint scraper tool. Easy. Paint scraper – I prefer to use a paint scraper with a wooden handle and a carbon steel blade. A plastic handle may melt, whereas a wooden handle will not; and a carbon steel blade will conduct heat better than a stainless steel blade. The Uni Pro Real Good Scraper was only $3.23 from Bunnings. Blow torch – I purchased a blow torch attachment that fitted directly onto the top of a butane gas cartridge. The cost was $8.98 from eBay (including freight), but depending what you select can be had for as little as $6 or $7. While the refillable pocket butane blow torches will work (I tried my wife’s blow torch from the kitchen that she uses for making creme brulee! ), I thought that the convenience of attaching directly to the top of a butane gas cartridge was preferable. 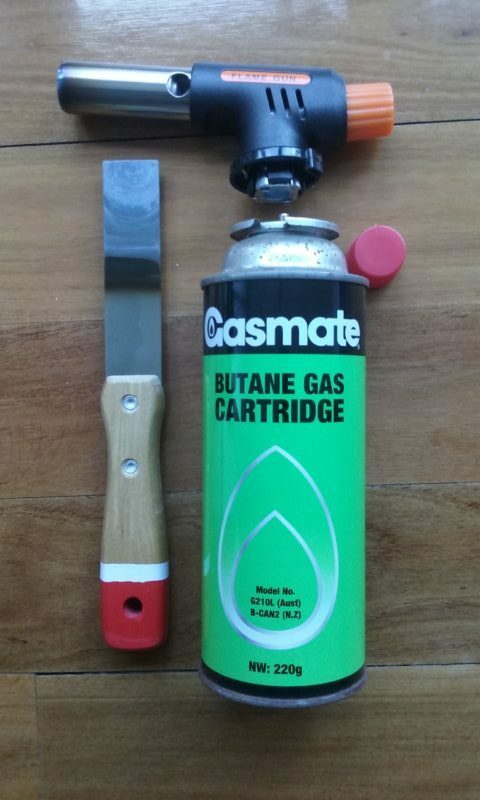 Butane gas cartridge – packs of four can be purchased for $4.45 from Bunnings – approximately $1.12 each. The total cost was $13.33. A paint scraper heated with a refillable pocket butane blow torch will get red hot. Using the larger blow torch attachment fitted to the butane gas cartridge heated a larger area of the end of the paint scraper to red hot in a much shorter time. A paint scraper heated with a butane blow torch will slice through 6 mm polyester rope with ease. For larger ropes, you may need to heat the paint scraper twice to make a clean cut and seal the rope. If you are only cutting ropes a couple of times a year this is not a problem, but if you are doing it weekly, you may want to purchase a more expensive electric hot knife that will make the cut in one action.